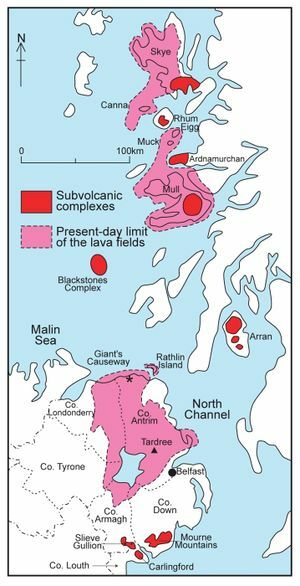 The end of basaltic volcanism in Northern Ireland during the late Palaeocene (c. 58Ma), coincided with the end of Phase 1 of the two major phases of magmatism in the North Atlantic Igneous Province . At present, the greatest thickness of basalt lava recorded is 780 m and 769 m in the Langford Lodge and Ballymacilroy boreholes (P947874) respectively . By contrast, on the Island of Mull (P947861) it is estimated that up to 1000 m of basalt lava had been eroded since the early Palaeogene . After volcanism in the later Palaeocene and Eocene, northeast Ireland and the lava plateau were affected by a post-magmatic, wrench-dominated stress system which produced conjugate NNW-trending (dextral) and northeast-southwest (sinistral) shears and NNE-trending normal faults . The effects of Palaeogene sinistral strike-slip on reactivated Caledonian fractures such as the Tow Valley, Carnlough and Sixmilewater faults, resulted in the present compartmentalisation of the basalt lavas. At the margins of the lava outcrop, the impact of vertical movement was most severe in north Co. Armagh where the lavas were eroded and the Lough Neagh Group oversteps southwards onto Mesozoic, Carboniferous and early Palaeozoic ‘basement’. However, by the end of the Eocene waning tectonic activity and denudation led to the virtual peneplanation of the plateau surface, although the pattern of fault-bounded blocks of lavas of either the Lower Basalt or Upper Basalt formations was by then well established. During the Oligocene, non-marine sedimentary basins subsided in response to syndepositional faulting. As a result, the majority of the new basins developed above major fault lines on a basalt land surface. In the Ballymoney area, the Lough Neagh Group rests unconformably on the Upper Basalt Formation in the hanging wall of the Tow Valley Fault (P947874). Although a precursor of this fault probably influenced the location of depocentres in the basin, the absence of thick conglomerates suggests that growth faulting was the dominant control and that sedimentation extended southeast of the fault line. Basin subsidence is believed to have occurred in a sinistral transtensional regime with NNE-SSW extension . Dilation of the NNW-trending fractures at their intersection with a principal displacement zone, the Tow Valley Fault, promoted continued basin subsidence. At Ballymoney, over 500 m of sediment filled the rapidly subsiding, pull-apart basin (P947874). Around Lough Neagh, the Lough Neagh Group is 353 m thick in the Washing Bay borehole  and 381m in a borehole at Derryinver which did not penetrate the base of the Group. ↑ Saunders, A D, Fitton, J G, Kerr, A C, Norry, M J, and Kent, R W. 1997. The North Atlantic Igneous Province. In: Mahoney, J J, and Coffin, M F (eds.). Large igneous provinces. American Geophysical Union Monographs, 100, 45–94. ↑ Wilson, H E. 1983. Deep Drilling in Northern Ireland since 1947. Irish Naturalist’s Journal, 21, 160–63. ↑ Walker, G P L. 1971. The distribution of amygdale minerals in Mull and Morven (western Scotland). In: Murty, T V V G G R K, and Roa, S S (eds.). Studies in Earth Sciences. W. D. West commemorative volume, 181–94. This page was last modified on 25 September 2017, at 13:40.